August is upon us, which means it’s the last gasp of summer before the Fall season kicks into high gear. I hope that you, dear readers, are absorbing my prose poolside or seaside or, at the very least, in front of an air conditioning unit. Of course, even during the laziest of lazy days, the New York theater scene is active with this summer seeing four Broadway openings. The next one? 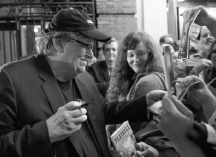 Michael Moore’s sure-to-be-incendiary stage evisceration of our darling Donald, The Terms of My Surrender. Moore isn’t known for his chic fashion sense, so I’m guessing Thursday’s opening night will be “Resistance Casual” (or, perhaps just, “Resist the Urge to Dress Up”). But expect it to be star-studded, with prominent lefties from Hollywood and D.C. flocking to the show even during regular performances. Can the show actually bring down the presidency, as the advertising campaign asks? Well, that seems to be happening all by itself. Though it won’t take a grand jury to determine whether or not Moore’s show is a hit. Early box office reports have been strong, and word-of-mouth is spreading faster than a juicy White House leak. Caught David Rockwell’s muse, Annaleigh Ashford, at the reception Rockwell threw at Ovando flower boutique (which he designed) on Madison Ave, before the opening night of the Public Theater’s A Midsummer Night’s Dream (for which, yes, Rockwell designed the set).